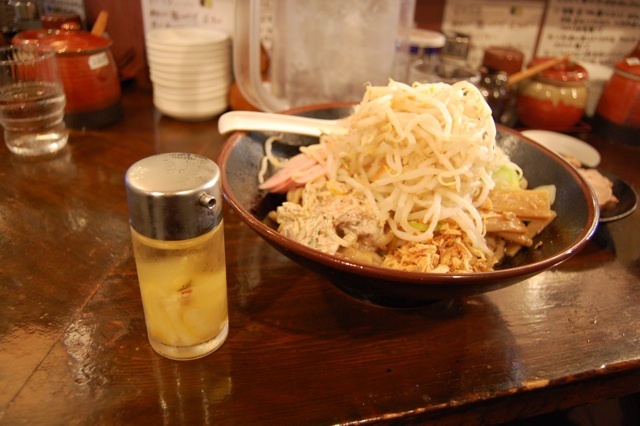 Tsukemen Momiji in Kokubunji is a popular shop that almost always has a line outside of its shop. We went recently to the shop 15 minutes before it opened and joined the queue. Most of those in line looked like college students, and all were men. 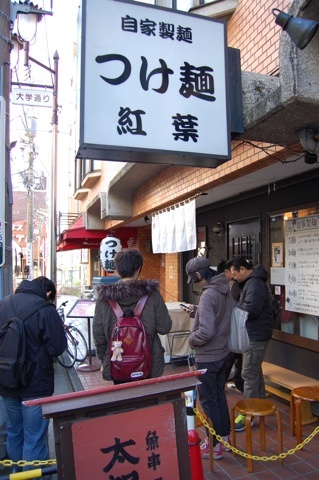 The sign above the shop says that the noodles are made by hand, “jikasei men” 自家製麺. 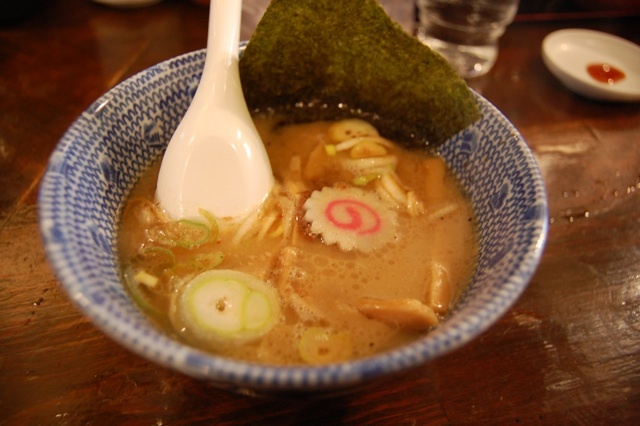 Momiji is known for its handmade ramen noodles and for its dipping broth for the tsukemen. The noodles and dipping broth are served in two separate bowls. The noodles are dipped into the dipping broth and then slurped up. And, just as done with soba, at the end of the meal hot water is brought if you want to try it with the remains of the dipping broth. 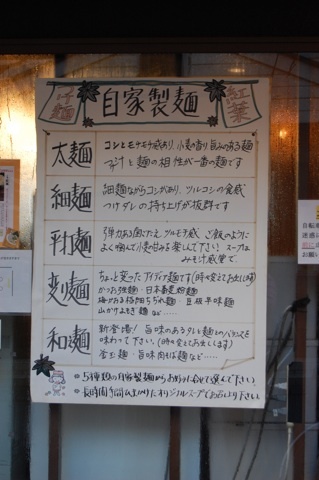 And, a handwritten sign listing the types of noodles that are made at the shop. The noodles are all made for that morning. Not sure, but I believe this is the owner of the shop. First and foremost because of the music that was playing. All classic 80’s hits, stuff like Journey’s Open Arms. The rest of the staff was young and surely this would not have been their preferred music at work. 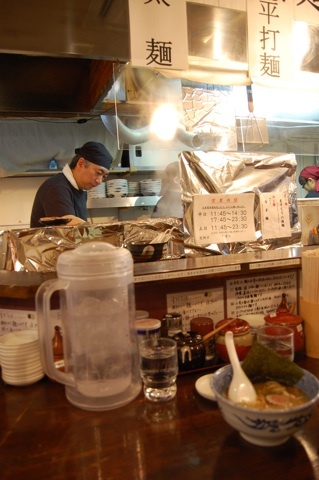 The owner was busy behind the counter cooking and serving the ramen. It’s a small shop, about a dozen seats at a long counter. There are a row of seats inside the restaurant against a wall for diners who are waiting for an open seat to sit at. The dipping broth for the tsukemen. It was very rich with lots of umami. You can see it had negi, menma, and naruto. On the shop’s website it says that the broth is made over 3 days using pork knuckles, chicken feet, pork bones, and chicken as well as smoked, dried skipjack tuna, flying fish, and mackerel. 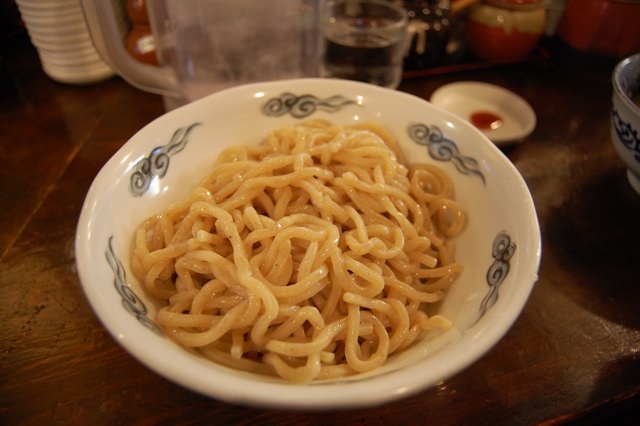 This was the futomen, the suggested noodles for the tsukemen. Very chewy and filling. 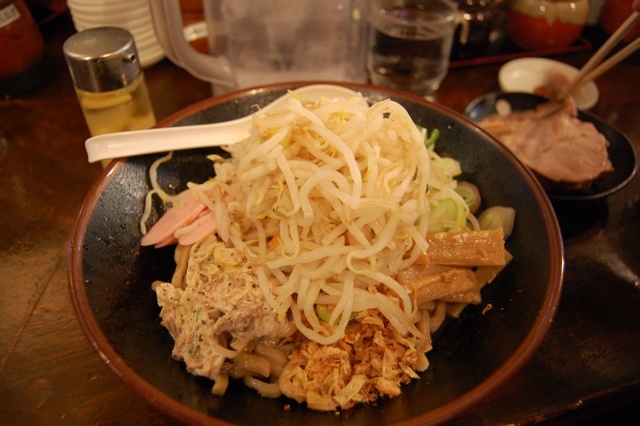 If I go back I’ll try the hosomen or skinny noodles as this was a lot of noodles. However, it was obvious that these were handmade noodles and not mass produced by the texture and flavor. The chashu pork which was very tender and meaty, a luxury as the ramen on its own was more than enough food. 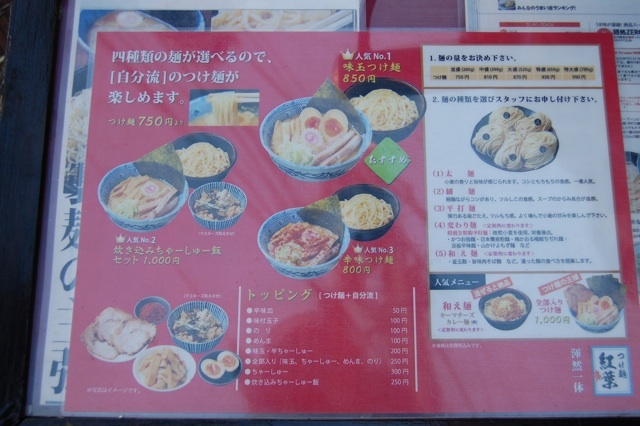 I tried the kawarimen which was on this day an aburamen, very little, rich sauce in the bottom of the bowl, noodles, and a variety of toppings like bean sprouts, seafood sausage, menma, garlic chips, and more. This too was generously portioned and too much for me to finish. 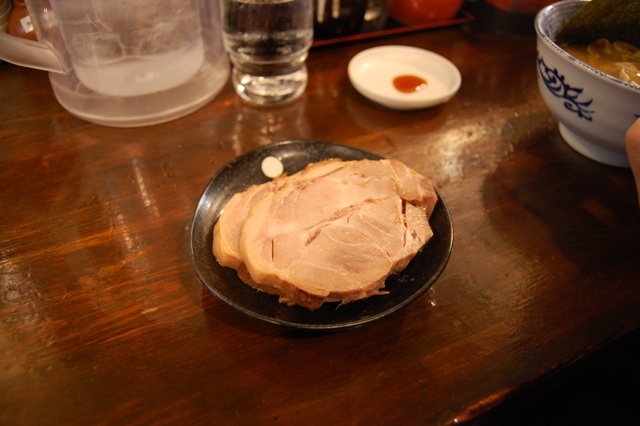 The kawarimen was served with vinegar that had sliced lemons in it. It was very refreshing and a good way to cut through the rich sauce in the bowl. If you are on the Chuo line or out in the Western part of Tokyo Momiji is good to have on your radar and worth visiting. The line moves quickly so don’t let that discourage you from coming here.